catalyst for action--advancing the health, sustainability, and protection of our environment. This goal will be accomplished through cross-sector dialogues, collaborative leadership trainings, action summits, and youth programs that lead to positive change. The Institute The Institute will benefit from recently-renovated facilities at Fort Baker. The historic military village is being converted into an environmentally-friendly lodge and conference facility, known as “Cavallo Point, The Lodge at the Golden Gate”. These facilities are located in a spectacular urban national park and within an international biosphere reserve. 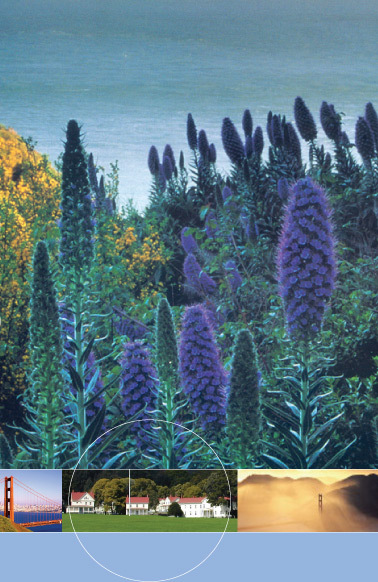 Environmental learning and discovery surround Fort Baker with rich natural habitat and innovative conservation programs in close proximity. Through a unique public-private partnership, the Institute at the Golden Gate is responsible for environmental programming at the site, with a focus on meetings, programs, and conferences. The Institute is a project of the Golden Gate National Parks Conservancy and the National Park Service who are committed to the environmental benefit of this site. We welcome organizations fostering critical thinking and action about key environmental opportunities and issues. Our capacity on an annual basis is over 5,000 lodging room nights and related meeting facilities. Qualified organizations will receive our Green Rate (tied to the Federal per-diem) for rooms, conference facilities, and food. Meetings Qualified nonprofit and government agencies will be able to use the Institute for one-night and multi-night scientific symposia, issue-based dialogues, social-change meetings, staff trainings, and board retreats. We offer a unique park-based location and environmentally friendly meeting and lodging facilities. The Institute can provide facilitators experienced with cross-sector dialogues and graphic recording, as well as place-based outdoor team building experiences, if desired. Programs The Institute’s programs will draw from themes of diversity, social change, business innovation, and environmental justice. Initially, we will build strategic partnerships with select organizations to develop program content. Ultimately, we will develop unique, signature content as well. A key goal is to ensure that the Institute provides access for the region’s underserved populations and links environmental topics to larger societal needs such as economic inequality, environmental justice, and affordable housing. Cross-Sector Dialogues: We believe that a key strategy for fostering the discovery of new possibilities and environmental action is collaborative cross-sector dialogues. The Institute will design cross-sector dialogues that engage diverse participants in grappling with the most pressing environmental and social concerns facing the nation and world. A key goal will be to broaden participation by ensuring a place at the table for underserved populations, whose voices are often absent from discussions of environmental issues. We are building partnerships with organizations such as The Aspen Institute to facilitate cross-sector meetings and environmental roundtables. Collaborative Leadership Trainings: Building on the National Park Service’s goal of promoting international leadership on conservation thinking and best practices, we will host collaborative leadership trainings that teach participants how to integrate multiple perspectives into shared values, vision, and action. We aspire to increase the capacity of non-profit, governmental, and green business leaders to work together across diverse boundaries and identify and implement new solutions. We are exploring partnerships with the Rockwood Leadership Institute, Hollyhock Leadership Institute, Marin Community Foundation, and Conservation Study Institute of the National Park Service. Youth: Building on our commitment to youth at the Crissy Field Center, the Institute will host summits and conferences that inspire and engage future generations. One example being explored is a Global Youth Summit on the Environment that might coincide with the Goldman Environmental Awards. Community Engagement The Institute will hold annual events that build connections within and among Marin and Bay Area communities. It is critical for the Institute to be seen as a valuable asset to the community. Place-Based Activities Highlighting our unique location in a National Park, the Institute will offer ½ day and full-day place-based activities for groups, adults, families, and youth to connect participants to the land and each other, promoting more effective teamwork and stronger relationships. Such experiences could range from a Survival Skills 101 course in the Marin Headlands, to Birding for Beginners, to a behind the scenes tour on Alcatraz Island. Other possibilities include a partnership with River of Words to teach placed-based poetry to youth and adults and with Daily Acts to provide local sustainability tours that highlight models of success. These programs will be marketed to both Institute and Cavallo Point guests.